Older Australian houses are not known for achieving thermal comfort during our summers and winters. In essence they rely on cheap energy to maintain thermal comfort. We could afford to build inefficient houses as the cost of energy has been relatively low and easy to access. So in a strange way houses are likely to become more energy efficient as energy prices increase. In the past we may have built attractive dwellings – but they did not insulate us terribly well from the outside environment. However, what if you are not allowed to rebuild your inefficient existing house as it falls under a heritage overlay? What if you are prepared to rebuild the heritage dwelling using similar details and construction methodology in order to achieve a better carbon footprint? What if your local Council prevented you from rebuilding your energy inefficient home to create a six star dwelling and reduce the need for fossil fuels. This is the quandary we face on one of our projects and I doubt the issue is limited to our studio. The history of this particular project is that about 10 years ago the rear section of a single fronted timber dwelling in the inner suburbs of Melbourne had been renovated to a reasonably high standard. The front timber section was left relatively untouched and the new owners now want to bring the front section up to a similar standard to the rear section. However, the house is in a overlay and we cannot rebuild the dwelling in a style that contributes to heritage of the street without demonstrating that the existing building does not contribute to the heritage of the street, The house is not significant in itself, in fact it has many unoriginal features as do each of the neighbouring houses – however we acknowledge that the dwelling does contribute to the heritage and character of the street. There is no doubt that the area has a distinct character and heritage value – but it not easy to say what the character really is or which elements contribute to that character. 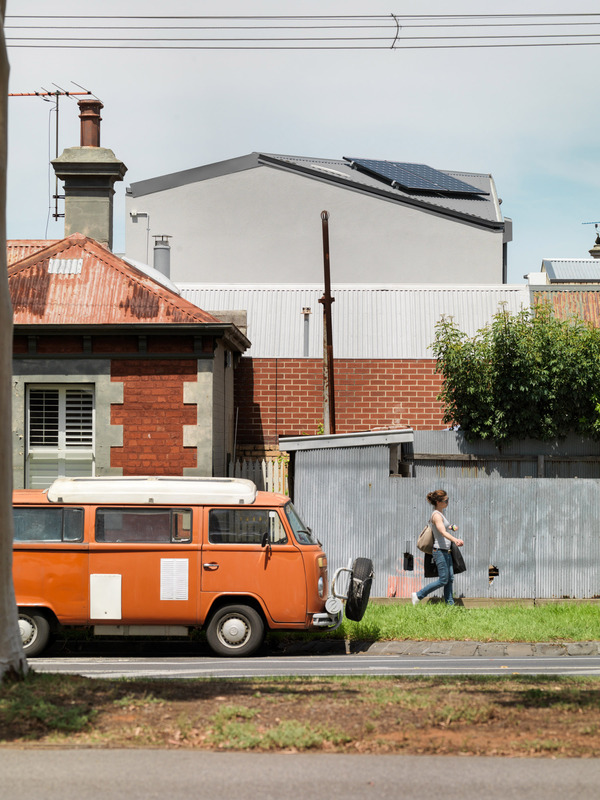 When we look at individual parts of each dwelling – we see that original timber windows have been replaced with aluminium units of a different size, There are old air conditioning units attached to windows and walls, and in one house the verandah post has been cut out to allow for a car to park off the street. We could describe the unoriginal features of the dwellings for an entire day and yet the street does have a distinct feel and sense of being cohesive and strangely unified. Technically we can renovate the dwelling from the inside, we can replace each element like for like – but we cannot – in theory – rebuild the existing dwelling to bring the house to an acceptable sustainability standard. Let’s dissect what’s happening – we built houses that we now consider to have heritage value. However, many were poorly insulated and poorly sealed and as a result we need more energy heating and cooling these spaces. As most of our power supply comes from fossil fuel we are essentially using non renewable resources to maintain our older homes.